In the near future, payloads will be hosted on self-assembling, modular platforms that provide plug-and-play interfaces and enable highly flexible repair and upgrade for both commercial and government missions. With hurricane season once again underway, as has just been aptly demonstrated by Hurricane Harvey, emergency preparedness has never been more vital. Threats in the cyber domain are only one of the challenges military communicators face today. Militaries around the world are seeking “assured communications.” Assuredness comes from multiple factors, including redundancy in components and systems that are resilient to weather, attack, or congestion — the ability to automatically switch frequency bands and satellites can help increase assuredness. In April of 2015, NASA announced the selection of SES to host the agency's Global-scale Observations of the Limb and Disk (GOLD) payload aboard the SES-14 spacecraft — the GOLD payload is an ultraviolet (UV) imaging spectrograph designed to measure densities and temperatures in Earth’s thermosphere and ionosphere. 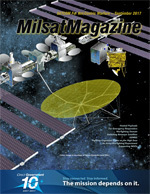 The following article was prepared by the Radio Technical Commission for Maritime Services (RTCM—www.rtcm.org/) for publication at the National Marine Electronics Association (NMEA — www.nmea.org/) infosite. Coastal countries face a group of wily opponents: illegal and unregulated fishing vessels, their owners and the black market. Earlier this year, Spectra Group (UK) Ltd. successfully participated in the 2017 Army Warfighting Experiment (AWE17). Ms. Véronique Mortier is a key account manager at Speedcast where she leads non-government organizations (NGO) and UN accounts, as well as enterprise and emerging markets.